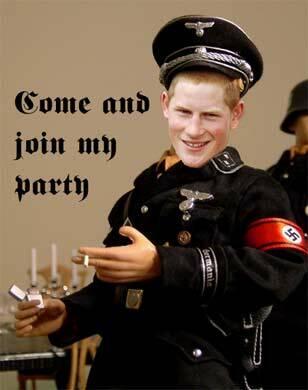 Irish Blog: WHO'S YER DADDY, Harry ? WHO'S YER DADDY, Harry ? If you didn't know who they were, which of the two would you say was Harrys'daddy?..bearing in mind Diana was "messing' about with the Major around the time Harry was conceived. You wonder where Harrys' ginger hair came from !! But then this is complicated and it may be that the milk man is Harry's grand father. I am not sure Lizzie will be happy to hear that. January 24, 2013 "The Independent" - - Winter has come and it seems that over the last few days leading figures in the War on Terror, unwilling to wait for Season Three of Game of Thrones to hit screens, have been re-watching past episodes to the point that it’s coloured their rhetoric. Between Cameron’s assurances of a war against sundry evil-doers that will last ‘decades’ and French Defence Minister Le Driand’s frank (and frankly crackpot) calls for a ‘total reconquest’ of Mali, the only question is: how long until we replace drones with halberds? The latest bit of martial cant has come from one dashing Captain Harry Wales; fighter, lover, occasional exhibitionist and warrior-prince of the House of Saxe-Gotha-Coburg. Having had his first tour of Afghanistan cut short, he has just finished his latest stint, where he has been fighting astride - or rather, in – Apache helicopters: the British Army’s multi-million pound engines of destruction. The poor lad’s been having a hard time, even Afghan warlord Gulbuddin Hekmatyar - a man whose admirable turn of phrase just can’t make up for his human rights records - called him a ‘shameless, drunken jackal’ recently. In all honesty, and I include a younger version of myself in this, that’s not a completely inaccurate description for young soldiers out on the town: hit the bars and clubs of Colchester on a Saturday night if you doubt me. That said, we didn’t generally take our disco-dancing shoes on operational tour and Harry doesn’t kill Afghans while intoxicated as Hekmatyar suggested – on this evidence he does it while stone-cold sober. Apaches are too precious and expensive to be flown by drunkards, regardless of their pedigree. In fact, given that we aren’t doing at all well in Afghanistan, even with our potent technology, Apache may be even more of a burden on taxpayers then Harry himself. While a number of Household Cavalry veterans have informed me that young Mr Wales was okay ‘as officers go’, which is a pretty glowing assessment in soldier-speak, his latest public comments do make him sound for the all the world like a gun-horny adolescent playing a pricey version of Call of Duty. Don’t get me wrong, squaddie culture and humour is close to the bone because the tasks soldiers are given are the grimmest imaginable and are often carried out, as in Afghanistan, without a mandate and with little public support. Brutal humour is often the only kind of armour a soldier can get hold of easily, I recall an expression brought back from Bosnia by older members of my own unit that seems to capture it: If you don’t laugh you’ll only cry. Captain Wales does come across as fairly casual when he talks about taking lives to save lives, stopping people doing ‘bad stuff’ and ‘taking people out of the game’. In his defence though, and given his much publicised record as the royal social hand grenade, he may be politically naïve, or it could be that he’s a young man who’s been strapped into an attack helicopter for 20 weeks. One of the best arguments against war is the effects it has on the people fighting – though clearly Harry is, unlike many of the infantrymen he’s supporting, a soldier by way of choice not economics, I would not wish sleepless nights on anyone, even as a republican. This trivialisation of violence is not new thing; it is part of the process of dehumanisation which is central to modern warfare. It seems to have taken on new forms in the post 9/11 campaigns. During his short-lived first tour as a tactical air controller – calling in air strikes – Wales and his colleagues watched the bombs hit from their bunker on a live-feed monitor nicknamed ‘Kill TV’. This notion of a kind of professional distance from the killing you are involved in is also expressed in the US military term for an Afghan, Pakistani or whoever killed by a drone strike; a kill is referred to humorously – and officially - as a ‘bugsplat’ after a children’s computer game. In all honesty, Harry’s comments are hardly revelatory and are tame compared to those I’ve heard from soldiers away from the media. To operate against and kill other humans, it helps to view this process as simply a job, however intellectually dishonest that is. Military training is sophisticated social engineering and wartime experience has the effect of ingraining a certain type of callousness. While war is a toxic institution, for some of those who conduct it, particularly privileged young princes who find themselves in the vanguard of US power, it can appear to be a latter-day boy’s own adventure. The author refused to serve a second tour in Afghanistan on legal and moral grounds, later spending five months in military prison. His book, 'Soldier Box', is published by Verso in May.